There was something pathetically nostalgic at the specter earlier this month of fast-food workers demanding compensation to the tune of $15 an hour for performing jobs that require almost no skills beyond not being in a coma. It recalled a halcyon age very long ago when management depended on menial labor, when a general strike of unskilled workers could bring bosses to their knees. As someone who worked a string of dirty, low-paying, soul-smashing jobs”including a stint as a French-fry chef at Wendy’s”to put myself through college, I bear witness that there is nothing remotely noble about being a menial laborer. It is a rancid myth, only a notch or two up the evolutionary ladder from the myth of the noble savage. While at college, I had my first encounters with a loathsomely clueless and punchably arrogant breed of born-bourgeois Marxist academics, who prattle endlessly about the proletariat’s virtues but have conveniently managed to insulate themselves from the rotten vicissitudes of working-class existence. You know the type”they reflexively use “capitalism” and “corporations” as pejoratives. They seem to have been energized and ennobled by the economic crash of 2007, blaming it on a “crisis of capitalism” rather than more likely suspects such as fiat currency, global finance, unsustainable government debt, offshoring, and unchecked immigration. But most importantly, this might not have been a “crisis of capitalism” so much as it was a crisis of human capital. The fact is, technology is rapidly rendering human labor next to worthless. Many of the snarkier, radicalized neo-Marxists that emerged in the recession’s wake are furious at “capitalism” for the fact that they owe $100,000 in student loans yet can”t find jobs, when they should be furious at themselves for digging a $100K debt to bankster gangsters all for the dubious privilege of tacking up useless sociology degrees to their studio-apartment walls. For some reason, despite all of Marxism’s historical failings, these dupes still consider Ol” Karl “relevant””more relevant than ever, if you can swallow that without choking. 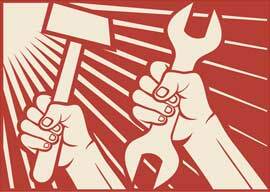 But Marx wrote The Communist Manifesto back when employers depended on manual labor”in other words, back when hammers and sickles were actually useful devices. Whatever blue-collar American jobs haven”t already been shipped overseas are rapidly being supplanted by embarrassingly more efficient hi-tech gizmos, thingamabobs, and doodads. Cashiers have been pushed aside in favor of self-checkout scanners. Factory workers and fruit-pickers are getting pink slips to make way for robots. Taxi drivers will soon be run over by driverless cars. And soldiers are increasingly useless when you can push a button and summon a drone. Some argue that these developments are ultimately good for workers, that it will free up more time for them to get a better education and adapt to our new “knowledge economy.” This presumes that much of the populace is educable, that those whose menial skills aren”t needed anymore will suddenly and magically muster the cognitive skills necessary to cut it in a more brain-intensive vocation.